I had never heard of Marissa Nadler before seeing her album review on Pitchfork way back in early February. What initially struck me about it was the stark album cover, a mostly black cover with a woman standing in front of a window. I wrote the name down and ordered it after I kept hearing about how good the album is… but then didn’t get around to actually listening to it for a couple more months. Why do I even have a blog? July is Nadler’s sixth album and it is mostly as stark as that album cover. Acoustic guitar is the main accompaniment to Nadler’s country-like singing tones which at times can swoop like Patsy Cline. There is desolate yet dreamy atmosphere throughout, a trend which gets acknowledged in the title of “Was It a Dream”. “I’ve Got Your Name” could soundtrack a David Lynch movie scene – “Riding back to Massachusetts, couldn’t even see from snow, the road was studded in Christmas trees”. A deep regret of a past relationship comes through in both “Anyone Else” and “Holiday In”. Records that sound like this are usually tailor made for summer evenings, sitting in backyards and staring at empty fields. July is different; it feels like it was recorded for winter nights, even if the title thinks differently. The backing vocals in “Drive” sound like a Northern wind blowing right through the song. As I sit here on this Labour Day weekend, the traditional end to summer where everyone clears out to their cabins, the empty town in “Dead City Emily” rings true. 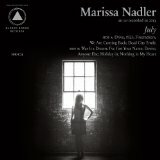 It’s hard to be a sleeper of a record when every publication has name checked it, but as the nights get colder and duvets start getting pulled out of the closet, Marissa Nadler’s July is a special one to have on your record player and clasped close to your chest.